A South African court has granted an interim order to prevent Sudanese President Omar al-Bashir from leaving South Africa, where he is attending an African Union summit, until it hears an application calling for his arrest. The International Criminal Court (ICC) issued an arrest warrant in 2009, accusing Bashir of war crimes and crimes against humanity related to the conflict in Darfur. He denies the charges. An application reportedly lodged by a human rights group was set to be heard in the Pretoria High Court at 3pm local time on Sunday to decide whether Bashir should be arrested. The judge said the court will decide whether a South African government cabinet decision to host Bashir would trump the ICC arrest warrant. Bashir boarded a flight on Saturday to Johannesburg to head Sudan's delegation at the summit which starts on Sunday, presidential sources and the state Sudan News Agency said. South Africa is a member of the ICC, which does not have its own police force and relies on member states to detain suspects. Since the arrest warrant was issued, most of Bashir's trips abroad have been to non-ICC states such as Saudi Arabia and Egypt. But he has also been to member states that have declined to arrest him, such as Nigeria, which hosted him in July 2013. "Allowing President al-Bashir into South Africa without arresting him would be a major stain on South Africa's reputation on promoting justice for grave crimes," Elise Keppler, acting international justice director at New-York based advocacy group Human Rights Watch, said in a statement on Friday. A South African government spokesperson declined to comment. Bashir cancelled a trip to Indonesia for a summit in April at the last minute. The plan to attend an Asian-African leaders conference in Jakarta sparked protests among rights groups, who want the president to be arrested. 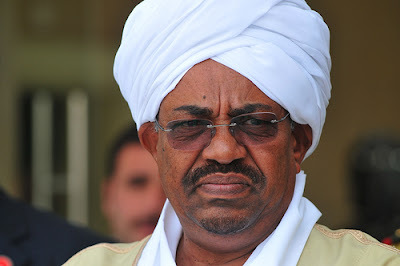 The Sudan People's Liberation Movement also advocated for the detention of President Omar Bashir insisting that "South Africa as one of the Rome Statute signatories is duty bound to arrest those who are wanted by the international justice," speaking through their secretary general Yasir Arman in a statement extended to Sudan Tribune on Saturday. Arman further said that Bashir’s visit poses a challenge for the independent judiciary of South Africa and previous statements by the Government of South Africa as well as it undermines "the history and the legacy of its people and the struggle of the African National Congress (ANC) against racism and war crimes.The rebel leader was alluding to statements by South African president Jacob Zuma. Following his elections in May 2009 Zuma said if Bashir was to ever set foot inside South Africa he would order him arrested. An African Union (AU) summit held in Libya in July 2009 adopted a resolution that they shall not cooperate with the ICC in executing the warrant. "We support the calls for the arrest of General al-Bashir and handing him to the international justice," he further said, stressing that the Sudanese president is continuing targeting civilians in Sudan.The SPLM-N rebels who fight against the Sudanese army since 2011 in the South Korodfan and Blue Nile states accuse the Sudanese army of targeting civilians in the rebel areas as part of a scorched earth policy. SPLM-N spokesperson Arnu Ngutulu Lodi on Staurdfay said that the Sudanese army bombarded several areas inhabited in the troubled South Kordofan state. Two Antinov and four helicopters gunship on 12 June dropped 20 bombs into Wad-Abuk town, caused casualties among the residents. Furthermore, they targeted cattle-keepers around the town where several herders, and dozens of cattle were killed, Lodi said. “Allowing President al-Bashir into South Africa without arresting him would be a major stain on South Africa’s reputation on promoting justice for grave crimes,” said Elise Keppler, acting international justice director at Human Rights Watch. “South Africa’s legal obligations as an ICC member mean cooperating in al-Bashir’s arrest, not in his travel plans,” Keppler further said.